It’s 2018. Smartphones and phone apps have been around for at least a decade. But we’re still lagging behind in a key area…there’s no clear and obvious software choice to use for personal productivity. Many of the popular to-do list apps are overwhelming and a poor fit for most. They have a structure and you either have to go with it or not. And if your preferences change, then tough luck. They impose their structure on you without any room for customization. In today’s article, we bring an incredible app proposal that surely is worthy of attention, especially if you are from the group of people like students, busy workers, highly responsible parent etc. Take a look at Tasker: To Do List, an amazing productivity app which will make your life easiest and smooth when day to day duties are in question. Now let’s see why you shouldn’t miss it! It’s an easy-to-use To-do list app which gives you the possibility to create task lists in a simple and effortless way, categorize all your task, prioritize and modify them or use it as a reminder if you wish or need. Create easily tasks, unlimited task to do lists, multiple tasks lists with headings and sub-list and then sort them by priority, name, and date. 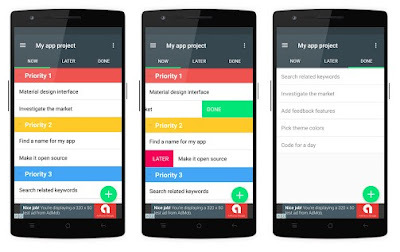 Anyhow, the Tasker: To Do List App will help you with your tasks, save data and notify your progress. Don’t miss this perfect opportunity to improve your productivity on daily basis, download it Tasker App on Play Store for free right now! Get it, use it and share your thoughts and opinions with us!